It’s an old joke, but useful for pointing out that seasonally adjusted job numbers and unemployment rates are a little more complicated than data that haven’t been adjusted. There are dramatically changing employment and wage levels in Alaska due to jobs that only happen at certain times of the year. Seasonal adjustment is a statistical method that attempts to eliminate the influence those fluctuations have on the employment and unemployment rates, making the underlying trends easier to see. Seasonal adjustment works because seasonal swings in employment and unemployment rates follow a predictable pattern. Over the course of the year, Alaska schools open and close, seasonal tourism workers arrive and leave, and fisheries follow mostly regular seasons. The number of people employed is much larger in the summer in Alaska, and the number unemployed is larger in the winter. 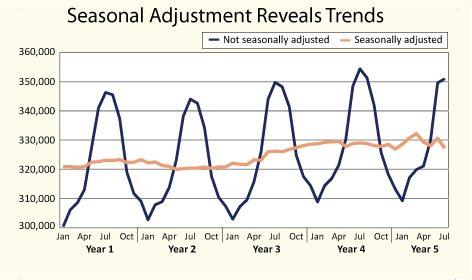 Using historical and current seasonal factors, seasonal adjustment smoothes each of these components to create the seasonally adjusted rate, which is the rate reported each month for the nation as well as the state. Seasonally adjusted rates are useful for comparing market conditions at different times of the year; for instance, January employment is always lower than July, but seasonal adjustment allows comparison of those two months despite the disparity in actual job levels. The seasonally adjusted unemployment rates and employment levels are also the most current and most cited nationwide statistics that are released monthly, so adjustment allows comparison of Alaska’s labor market conditions to other states and the nation. Source: Employment Scene, November 2012 Alaska Economic Trends.